Marybelle arrived in the UK from Romania - Flicka’s first donkey and a very sad ‘aged’ lady whose condition overwhelmed us with helplessness. With the most appalling emaciation, overgrown feet and open infected wounds on her skin we didn’t even realise then that the worst of her condition was not known to us. Marybelle had such bad teeth her mouth was ulcerated, not only that, her tongue was impaled onto a razor sharp tooth and so badly infected she couldn’t close her mouth, she hung her head in pain and depression, when the vet visited he thought it may be kinder to put her quietly to sleep. Poor Marybelle, saved from hell to lose her life at the last hurdle, it was only when she tried to feed from our hands did we decide to give her the best chance we could. ​Marybelle’s story is a long one of treatment and rehabilitation; you can read her full story here. 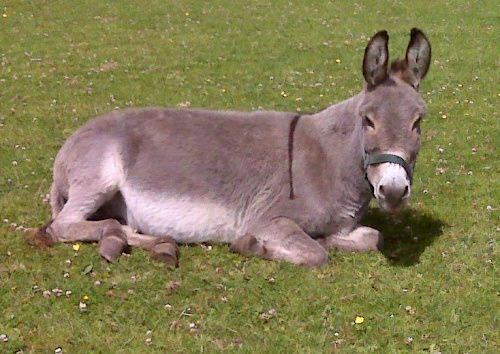 Marybelle enjoyed almost 10 wonderful years at our sanctuary before we had to say goodbye on 31st March 2018.